Not to be confused with Classic World 1-1. The course as shown on the selection screen. Mario Classic 1-1 is the first Coin Hunter course in Mario Hoops 3-on-3. It is only available for local multiplayer matches. The course itself is a direct reference to World 1-1 of Super Mario Bros. on the Nintendo Entertainment System, as the background of the course shows many items from the original World 1-1. Ninja beginning a match on Mario Classic 1-1 against Luigi. The course is fairly simple, with no structural hazards. Up to eleven total ? 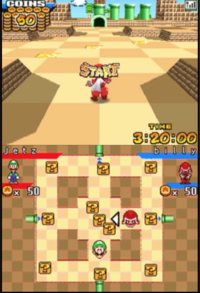 Panels are scattered across the course at a time, all giving out items to the player which he or she may use in order to get coins from his or her opponent. There are a total of four Warp Pipes, that teleport the player directly across the map. The player can only enter into the pipes at the top of the map and at the right, as the other two pipes are where these two pipes lead to. There are four raised platforms that surround the center of the map, creating four pathways that lead to the Warp Pipes and the rest of the map. Items may not travel through the Warp Pipes, giving the player brief invincibility while they are inside. The player with the most coins when the 3:20 time limit is up is declared the winner. This page was last edited on May 30, 2018, at 22:16.